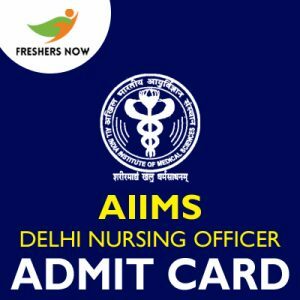 AIIMS Delhi Nursing Officer Admit Card 2019: Applied candidates can only get the valid aiims.edu Nursing Officer Hall Ticket 2019 from 19th February 2019 through the official site. And the officials of the All India Institute of Medical Science (AIIMS), Delhi had strictly announced the AIIMS Delhi Nursing Officer Exam Date 2019 as 28th February 2019. So, to attempt the test, you have to download the AIIMS Delhi Nursing Officer Admit Card 2019 by following the steps as provided below. Furthermore, we have clearly mentioned the AIIMS Delhi Nursing Officer Selection Process 2019 through which candidates get hired. Candidates can directly check this section to know the AIIMS Delhi Nursing Officer Selection Process 2019 that was announced by the All India Institute of Medical Science (AIIMS), Delhi officials. Those who get qualified in the initial exam will only be qualified further. Soon after downloading the AIIMS Delhi Nursing Officer Hall Ticket 2019, all you need to check the details present on it once. If any of them go wrong then you must intimate that issue to the officials. So that they will rectify and send to the candidate mail. Well, the officials of the All India Institute of Medical Science (AIIMS), Delhi are planning to conduct the AIIMS Delhi Nursing Officer Examination on 28th February 2019. So, all the applied candidates need to check the AIIMS Delhi Nursing Officer Exam Date to complete the preparation. Moreover, to attempt the test, candidates must and should have to download the AIIMS Delhi Nursing Officer Hall Ticket 2019 before the test date. So that you can avoid the last minute rush. All the candidates who are appearing for the upcoming examination need to make a note that without any identity proof no candidate will be allowed into the exam hall. To download the AIIMS Delhi Nursing Officer Admit Card 2019, all the candidates need to follow the below given steps. So that they can easily get that from the official site. Then, you can see the home page of the organization. Moreover, all you need to observe the Important Announcements section on the screen that appears to the right side. Then, find or search for the direct link that refers to download the aiims.edu Nursing Officer Hall Ticket 2019. Soon after finding out the link, click it and then enter the asked details to access your AIIMS Delhi Nursing Officer Admit Card 2019. On submitting the page, you can easily observe your hall ticket. Download it and also take out the printed copy for further reference. We hope that all the candidates who are waiting for the AIIMS Delhi Nursing Officer Admit Card 2019 will be benefited with the above-given information. So, do bookmark us by Ctrl + D to get all the alerts @ Freshers Now. For any other queries, you can simply keep commenting us in the below section of our webportal. So that we will soon respong to you with the update.